Episode #13 of Inside BU Hockey features Bernie Corbett’s interviews with Coach David Quinn, freshman right wing Nick Roberto and former BU standout and current Anaheim Ducks center Nick Bonino. Bonino came to BU from Avon Old Farms where he captained the Winged Beavers to the 2007 New England Prep title and earned USHR’s Prep Forward of the Year designation. Armed with a sniper’s ability, he put up 117 points (45G, 72A) in three seasons on Comm. Ave, including 50 points in BU’s 2008-09 NCAA championship season. He’s enjoying a breakout season with the Ducks and currently has 33 points in 48 games. Terrier fans never tire of re-living the most memorable goal of his BU career. Bonino celebrated his IBUH appearance with his second career multi-goal game, slapping home a pair of power play goals in the Ducks 9-1 thrashing of the Canucks and earning first-star honors. With 15 goals and 20 assists, he’s one point shy of doubling his previous best point total in an NHL season. Terriers, continuing to add high-end talent to its recruiting classes, have received a commitment from Spruce Grove (AJHL) defenseman Brandon Hickey for next season. The 6-2, left shot from Leduc, Alberta, is in his second full season with the Saints and has tallied 4 goals and 12 assists in 37 games. In the recently release NHL Central Scouting Midterm Rankings, Hickey was #63 among North American skaters, becoming the sixth BU recruit ranked for the 2014 draft. 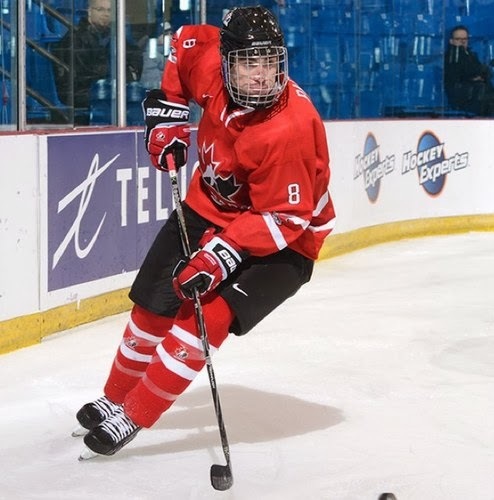 Earlier this season, he skated for Canada West in the World Junior A challenge and a year ago played in the World U17 tournament for Canada Pacific, where most of the players were from major junior teams. In 2012, he played in Canada's prestigious Tellus Cup tournament, competing against future Terrier teammate A.J. Greer, now at Kimball Union. Hickey brings a skill that all scouts love and that’s skating. The 6-foot-2 D-man has improved his offensive production with the Saints, totaling four goals and 16 points through 37 games after notching just seven all of last year.